We are Making Changes On Our Site … Stay Tuned! Brandon Blankenship Grill Master? Not Likely. 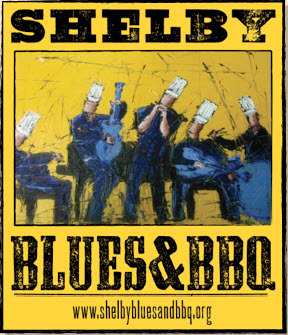 Around September 2011, the Greater Shelby Chamber of Commerce organized the first ever SHELBY BLUES AND BBQ, presented by the CITY OF PELHAM. 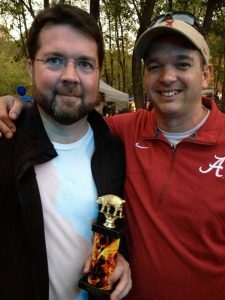 Our buddies over at the Chamber invited us to attend in the amateur class of the grilling competition. We had just suffered through the ouster of a partner and needed to focus on a little fun so we jumped at the opportunity to basically tailgate at our backdoor with live blues. Greg Harrelson grill master? Brandon Blankenship grill master? Not likely. Greg Harrelson got busy with what he does best: smack talk. He issued a statement to competing teams that if they bothered to show up at all, they shouldn’t waste a bunch of money on ingredients. They should just buy Kraft BBQ and admit defeat. Neither Greg nor I, however, had a grill or smoker that we could compete with. We searched and searched. A competition worthy grill is expensive! Based on the expense alone, it didn’t make sense to buy a grill. Greg (our resident negotiator) would have never agreed anyway. So, we scoured the state for a grill we could borrow. Finally, Greg’s neighbor agreed to loan us his grill. For years, it had been in service for church fundraisers and it was perfect. 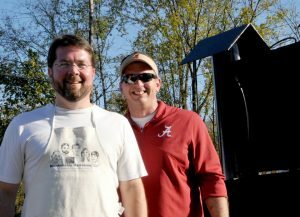 We were off – amateur competition with a borrowed grill. The competition day was a win whether we placed or not. The weather was perfect. It was basically tailgating with large screen TVs … kids area with crafts, face painting, inflatables … corn hole … and fabulous blues music! Not too long after we started setting up there was a call for a chefs meeting so Greg and I went over. We knew we were in trouble when one of the chefs objected to the system that had been set up for submitting entries. Apparently, some teams were closer to the judges than others so they would enjoy “up to a four-minute advantage” over other teams. We looked at each other and laughed. If four minutes made a difference, there was no way we stood a chance at winning. Then they handed out our “team packets.” Amateurs competitors received one type of packet and professionals received another. Somehow we were classified as professionals. I’m not sure if we filled the paperwork wrong or if our buddies at the Chamber thought this would be a funny practical joke, but let me recap for you: no prior competition experience, a borrowed grill, a handful of recipes that we strategized over for hours but had never tasted. Pro-grillers – no way! As with anything, Greg is in-it-to-win-it regardless. So, we headed back to our grill to have the meat inspection (these grilling competitions have a bunch of rules about what you can and can’t do before and during the competition). After the inspection, we could light our fire, but nobody on our team had a lighter – a match or a smoldering ember. We had to borrow a match to start our fire. Let me recap again: no prior competition experience, a borrowed grill, untested recipies and a borrowed match. Even so, we had a great time, while we were preparing our entreis for competition we server over 200 people with samples, many friends came out to visit with us, eat and enjoy blues music. Against all odds, we actually came in second place! Here are Greg and I holding our trophy. Shelby Living Magazine did a great article. Never satisfied to leave well enough alone, we accepted the challenge to return the next year. Unfortunately, however, the grill we had borrowed before was not available. We discovered that not to far away in Alabaster Alabama there was a guy named Joe that made grills. And, he doesn’t just make grills, he has a passion for making grills and smokers. In fact, he is so passionate about making grills that he is reluctant to sell the ones he makes. In fact, if he doesn’t like you, he won’t even loan you one. After several visits and even more conversations, Joe finally agreed to loan us a grill – and it was beautiful. He did come out to check on it at the competition. Blues and BBQ as an event has ended. If we had never placed, it was one of the best events I have ever attended for myself and my community. Thank you. Thank you. Thank you to everyone that participate on the team and made it so much fun. Special thanks to the Greater Shelby County Chamber that made such a great investment in making our community better. The question: Brandon Blankenship Grill Master? Greg Harrelson Grill Master? still remains. We will live it for you to decide. The proof is in the sauce. 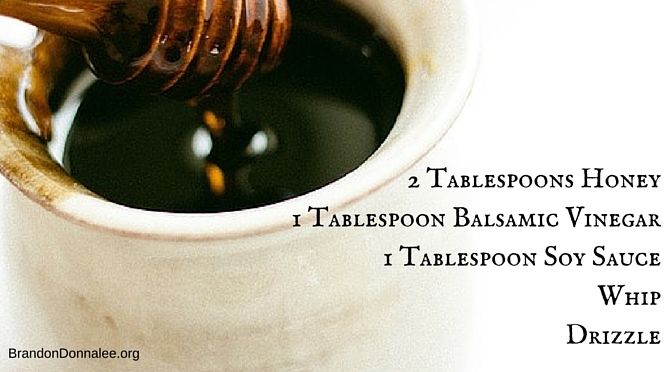 Try our honey vinaigrette on the next thing you grill or on a salad. The decide if we are grill masters or not.